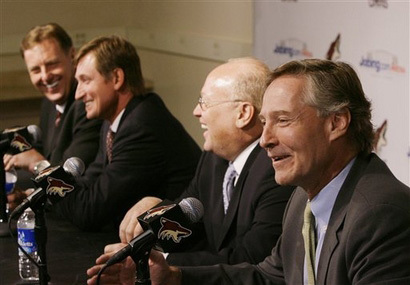 Phoenix Coyotes CEO Jeff Shumway announced on Tuesday that Don Maloney has agreed to a multi-year contract to become General Manager of the Coyotes. As per club policy, terms of the contract were not disclosed. 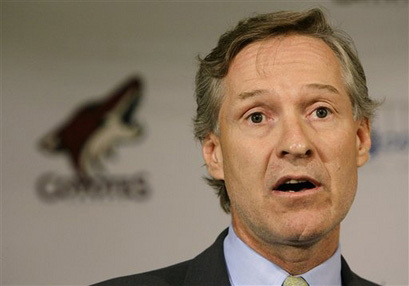 Maloney joins the Coyotes from the New York Rangers for whom he served as Vice President of Player Personnel and Assistant General Manager. He assisted Rangers’ President and General Manager Glen Sather in all player transactions and contract negotiations and was involved with the team’s professional and amateur scouting operations. The native of Lindsay, Ontario spent 10 seasons in the Rangers’ front office. Maloney, 48, played a key role in the Rangers development of several prospects into productive NHL players which recently have included Henrik Lundqvist, Peter Prucha, Fedor Tyutin, Thomas Pock, and Ryan Callahan. The Rangers reached the Stanley Cup Playoffs this season for the second consecutive campaign and advanced to the Eastern Conference Semifinal after sweeping the Atlanta Thrashers in four games in the Quarterfinal. Recognized as one of the deepest organizations in the NHL, the Rangers’ top minor league affiliate, the Hartford Wolf Pack, have reached the American Hockey League playoffs in each of the last 10 seasons and won the league’s Calder Cup Championship in 2000. Maloney also served as Assistant General Manager for Team Canada squads that won gold medals at the 2003 and 2004 IIHF World Championships in Finland and Czech Republic respectively. Maloney’s first front office position in the NHL was as Assistant General Manager of the New York Islanders following his retirement as a player with the club on Jan. 17, 1991. Maloney later served as Islanders’ General Manager from Aug. 17, 1992 to Dec. 2, 1995. Among the players drafted by the Islanders during Maloney’s tenure with the club were Todd Bertuzzi, Bryan McCabe, Zigmund Palffy, Tommy Salo, and Darius Kasparaitis. Maloney also served as Eastern Professional Scout for the San Jose Sharks during the 1996-97 season prior to joining the Rangers’ front office. As a player, Maloney registered 214 goals, 350 assists, and 564 points as well as 815 penalty minutes in 765 regular season games over 13 NHL campaigns with the Rangers, Hartford Whalers, and Islanders. He also collected 22 goals, 35 assists, and 57 points in 94 career playoff games. Maloney spent 11 seasons with the Rangers after being selected by the club in the 2nd round (26th overall) of the 1978 NHL Entry Draft. He helped lead the Rangers to the 1980 Stanley Cup Final by posting 20 points (7 goals, 13 assists) that postseason, a playoff record for rookies at the time (since broken). Maloney played in the NHL All-Star Game in 1983 and 1984. He was named Most Valuable Player in the 1984 All-Star Game. Maloney received the Rangers’ Players’ Player Award as voted by teammates on three occasions (1979-80, 1980-81, and 1986-87). He also won the Rangers’ “Crumb Bum” Award for service to New York youngsters in 1984 and the team’s Good Guy Award in 1981 for cooperation with the media. Maloney and his wife Toni have a son, Don.